We have a couple or three people who are now sleeping in our park semi-regularly. They started with sleeping on the ground, which progressed to sleeping on top of newspapers, which then became cardboard. They now have a mat. 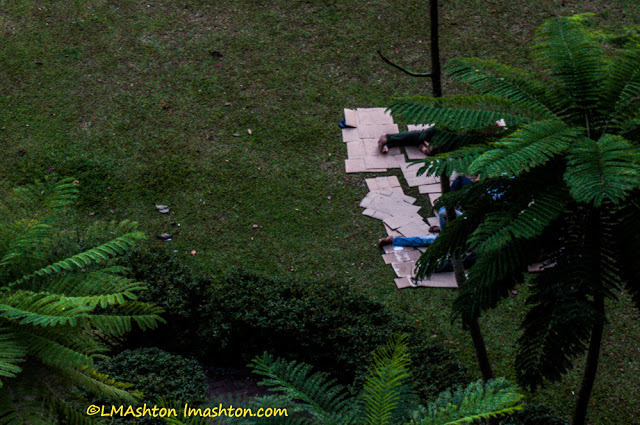 And it's nearly 8am and dozens of people have been walking around and through that park, and still they lie there. They look like they're awake – they're moving around. Yeah, we think they're homeless. We looked at some hole in the wall not very nicely done apartments with 225 square feet – enough room for a bathroom, a sort of kitchen, and a bedroom. No, that 225 square feet was not a typo, and, for that matter, it was the largest apartment in the lot – the rest were 210 square feet, all at S$1500 a year and a half ago. No doubt it would be more now. The kitchen included a bar fridge, a single induction burner, a washer, and counter space. No cupboards. No table nor room for one. The bedroom had about six inches on either side of the bed, if I recall correctly. I don't recall if it had a wardrobe or not – it might not. And there was a study desk with a single chair. No room to walk around. It was in a building with lots of other simliar apartments – each normal sized apartment had been further contained into five small apartments. It's one way of maximizing on rent returns, I suppose. That was the cheapest one bedroom apartment we've seen here, and it wasn't particularly close to bus, MRT, shopping, or anything else. There are no minimum wage laws in Singapore, so there are some people who just cannot afford $1500 a month for rent. Usually, they flat share. The last apartment we lived in – long story here, but we left because of deceptive practices and theft (they drank at least half of every jug of milk we had!) – started out as a three bedroom plus maid's quarters, supposed to have five or six people living there. Then they blocked off the living room (studs, drywall, paint) and made it into another bedroom so they could get two more tenants. By the time we left (we stayed there for only two months), there were nine people living there, counting us. They were charging $2000 for the master bedroom, probably $1500 per bedroom otherwise, except for the maid's room, which might be, say, S$1000 or so. Add on utilities on top of that, and, yeah, it ain't cheap. We're also just across the street from a mall with a grocery store, lots of food outlets, and the MRT, so this location is a bit more. If we were further out, we could save some money. The first apartment we lived in here was also a flatshare, six people in four bedrooms. The master bedroom was $1500 and it went down from there. We were about 600 or maybe 700 meters from the nearest MRT station, so relatively convenient location. Flatsharing is extremely common in Singapore. Extremely. Even families with children will rent out a room to bring in money to cover a portion of their mortgage or rent. Grandmothers do this to cover their expenses if they're retired or don't otherwise make enough.